Food Blogga: The Encyclopedia of Sandwiches is Released Today! The Encyclopedia of Sandwiches is Released Today! Hundreds of millions of you who read this post today will also eat a sandwich. OK, maybe hundreds of millions of you won't read this post (it is a Tuesday, after all), but you will eat a sandwich. Will it be a classic breakfast sandwich of tender eggs, melty cheese and crisp bacon on a toasted English muffin? A humble lunchtime ham and cheese? Perhaps it'll be a delightfully gloppy Sloppy Joe with the kids for dinner. Everyone loves sandwiches. That's because they are among the most democratic of foods. They can be eaten in your car at lunchtime and over the kitchen sink at midnight. They can be a quick snack or a bona fide meal. Decadent or plain, six inches or six feet, sandwiches have always been filling, unfussy, honest food. The book shares recipes, history and trivia for 110 beloved sandwiches and includes over 400 variations. Each sandwich, as you can see from the images here, is accompanied by a full-color, gorgeous photo beautifully styled by Adam C. Pearson and photographed by Matt Armendariz of Matt Bites. Thank you, gentlemen, for your talent, creativity and hunger! The book would never have been as tasty without the guidance of my editor, Margaret McGuire. Thank you for your support, wisdom and humor. Many thanks to Jenny Kraemer for her fresh, stylish design and to sandwich aficionados Jane Morley and Alenxandra Bitzer for their research and editorial support. Thank you, Food Blogga readers, for your encouragement and support. You are fabulous! Finally, thanks to my dad thanks for proudly telling every person in Rhode Island about this book. To my mom for happily testing every recipe in this book. And to Jeff, for eating every sandwich in this book. Often more than once. And for never complaining when his jeans got tight. Pulled Pork Sandwich -- Oink! Oink! In The Encyclopedia of Sandwiches, you'll find cherished classics such as Peanut Butter and Jelly, Fluffernutter and the Muffuletta as well as perky up-and-comers including The Cubano, the Artisanal Grilled Cheese Sandwich and the Vietnamese Banh Mi. The Mexican Torta. Get ready to unbutton your jeans. Regional favorites such as Hawaii's Spamwich, New Orleans's Po' Boy and Pittsburgh's Primanti are included along with quirky creations such as The Potato Chip Sandwich, The Chow Mein Sandwich and The Doughnut Sandwich. Belly-busters such as the Italian Hoagie, The Muffuletta and the all-American Jucy Lucy, or "inside-out" cheeseburger, share space with Skinny Sandwiches including the Grilled Portobello Sandwich, the Salmon Sandwich and The Roasted Vegetable Panini. We all scream for Ice Cream Sandwiches! You didn't think we'd leave out desserts, did you? The book has several sweet options including the kid-friendly Banana Split Sandwich, the adult-friendly Nutella Sandwich and everyone's favorite frosty treat, the Ice Cream Sandwich. Whether you're a carnivore, vegetarian or omnivore, you'll find plenty of tasty options between sliced bread in The Encyclopedia of Sandwiches. 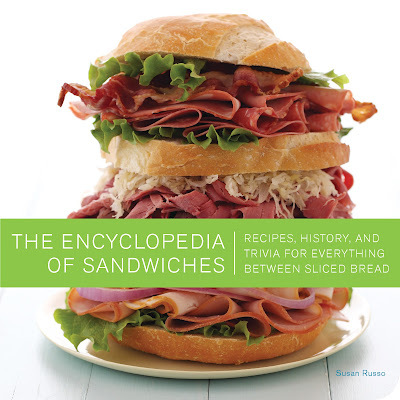 The Encyclopedia of Sandwiches, Recipes, History, and Trivia for Everything Between Sliced Bread (April 5, 2011). Published by Quirk Books and distributed by Random House, Inc.
Congratulations. When I see it on the shelf at the book store I will exclaim loudly for all nearby- Wow, it is finally here I have been waiting for this great book. I am looking forward to reading your book and making some of the sandwiches. Awesome Susan! Congratulations! I will be getting a copy! I love that you included ice cream sandwiches in your book. Each month we have a themed potluck (such as fondue, etc...)at work and once last year it was sandwiches. Everyone that it was so great that I brought homemade ice cream sandwiches for dessert. They are easily impressed! Photos look very good and sounds like a great selection of sammys. Yay! Can't wait to read it, Susan. So happy for you - congratulations!! Love sandwiches and eat them almost everyday either for breakfast, lunch or dinner. Hi Susan, I am so happy for you! Can't wait to get your book..oh, and you are the only other person I know that wraps their meatloaf in bacon!My Mom did it ..I do it ..must be an Italian thing...it is great for sandwiches too! Many congrats again, Susan! I've got my copy ready to review soon. Thinking about tackling that Dagwood! Susan! I just got a copy of your book the other day. It's beautiful and fabulous. Can't wait to dig into some of these recipes. Congratulations! I received this book from Quirk, and I love it! I am so pleased that there are such beautiful pictures to accompany each recipe, and I have already bookmarked several recipes to try. Congratulations on the book; you should be very proud! They all look wonderful. Congratulations! That's great news Susan! Hearty congratulations on the release! I am so excited and fondly remember the time we met in SFO..
Congrats! It looks overwhelmingly delicious and appealing. From the beginning on I needed to get a copy. Now I long for it even more. I love your ideas and inspirations truly. Thx for always being fresh and a step ahead. At long last, WICHOPEDIA is here! Yay! Congratulations to you Susan! I cannot wait to get my hands on this one. The photos are beyond gorgeous! Fantastic mouth watering images! Congrats! congrats, susan--it really is an outstanding book! I've become totally bored w my plain Jane turkey sammies so this book is very exciting for me. I've been anxiously awaiting for a copy to review from Eric, if I see one before then I'll surely grab it. Congratulations. This sounds like a book that should be in every home. We all eat sandwiches. Congrats! Just came across your wonderful blog and am a new follower!!! Congratulations Susan! It's on the wish list and soon will be in the shopping cart!